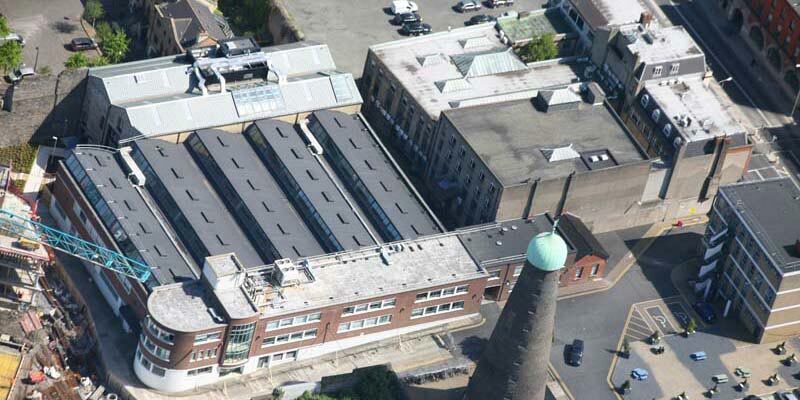 Select Roofing were contracted directly by the Digital Hub Agency to perform an extensive survey and refurbishment of the existing roofing present at the Digital Hub in line with the modern requirements of a technological institution. This involved designing a detailed and comprehensive replacement and installation programme taking into account the client requirements, Health and Safety guidelines and ensuring minimum disruption to activity within the area during works. We began by stripping the existing asphalt roofing in a stage-by-stage process co-ordinating it with a recovering process using Icopal bituminous felt built-up system as well as installing an AllenkeyGuard Guardrail system. Existing live building, plan to keep it live during work. The result of the upgrade works was an increased security against weather elements as well as a significantly better u-value for the buildings decreasing heat loss and energy costs. As we are an Icopal IMA approved contractor we were able to offer the client a full insurance backed warranty for both the materials used and the work carried out.